The Liverpool Scottish Museum Archive was housed in New Zealand House from 2008 and is now in the Artists Club since 2011. During this period we have been able to undertake more extensive cataloguing of the contents. It became clear that although the number of film and sound items was limited, there were important recordings in various formats that deserved a wider audience within the Liverpool Scottish and beyond. Whilst the Presentation of Colours film is of professional standard, the 8 mm film is essentially hand-held ‘home movie’. There are, however, plenty of recognisable faces and some very interesting scenes. a compendium of training film shot by Captain Hertzog in 1957/1958 showing, amongst other events, training for the Duke of Edinburgh’s Trophy at Otterburn Camp. the opening of the RAMC Barracks in Wellington Road in Liverpool in the 1950s by the Right Rev Bishop Christopher Chavasse (twin brother of Noel) and Sir Arthur Gemmell, a Liverpool Scottish WW1 officer who later became a doctor and President of the Royal College of Gynaecologists and Obstetricians – there is an additional separate and previously unpublished soundtrack to this in which Sir Arthur recalls Noel Chavasse at first hand. A film compilation from V (The Liverpool Scottish) Company covering the 1970s and 1980s from a source that we will be happy to acknowledge but cannot as yet identify. This covers various Remembrance Day Parades, extensive coverage of both camps in Cyprus (1972 and 1974 including Fancy Dress parades and the evacuation from the Akamas Peninsula), camp at Tenby, assorted rifle meetings and adventurous training in the Lake District. A sound recording of Frederick Jackson, a survivor of the Liverpool Scottish charge at Hooge on 16 June 1915. He speaks with clarity and eloquence. Veterans closely connected with the Liverpool Scottish over the last twenty to forty years will certainly recognise others and very possibly themselves. We have called this ‘Volume 1’ as we may be offered further material. There is footage on the Pathé News website: the cost of reproduction of copyright quality film is highly prohibitive. The cost of the professional preparation of the DVD set has been funded entirely by the Museum Trust which receives no public funding and is mainly reliant on voluntary donations and the generosity of time and petrol of its handful of volunteers. The Trustees see this project as part of their duty to preserve the history of the Liverpool Scottish but wish to recover a reasonable proportion of the costs which totalled over £600 with frame by frame digital re-mastering and DVD engineering. 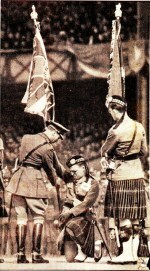 The music soundtrack throughout (with the exception of the ‘Film Compilation’ on DVD2) is taken from recordings of the Pipes and Drums of the 1st Battalion, The Liverpool Scottish, the Pipes and Drums of the 1st Battalion, The 51st Highland Volunteers and the 51st Highland Volunteers Military Band. The origin of the sound from the ‘Film Compilation’ is unknown except that there some passages of ‘Braveheart’ dialogue. The Liverpool Scottish Museum Archive since 2008 has undertaken an extensive cataloguing of its contents. It became clear that although the number of film and sound items was limited, there were important recordings in various formats that deserved both presevation and a wider audience within the Liverpool Scottish and beyond. An intital two DVD set has been produced containing films from a number of sources. Whilst the Presentation of Colours film is of professional standard, other 8 mm film is essentially hand-held ‘home movie’. There are, however, plenty of recognisable faces and some very interesting scenes. These include the very high quality 16 mm colour film of the Presentation of Colours in 1938 by His Majesty King George VI at a packed Goodison Park. These are the Colours laid up in Liverpool Town Hall in October 2009 after seventy-one years of service. The drill of all four guards, rehearsed during annual camp, would do credit to a regular battalion. If you enjoy the Trooping of the Colour, you will enjoy this. Veterans closely connected with the Liverpool Scottish over the last twenty to forty years will certainly recognise others and very possibly themselves. Click on the image to the right to see a short clip from the 1968 Camp. We have called this ‘Volume 1’ as we hope to be offered further material. The cost of producing this professional quality DVD set is prohibitively expensive and has been funded entirely by the Museum Trust which receives no public funding and is reliant on voluntary donations and the generosity of a handful of volunteers. The Trustees see this project as part of their duty to preserve the history of the Liverpool Scottish but wish to recover a reasonable proportion of the costs which totalled over £600 with frame by frame digital re-mastering and DVD engineering. Your support, by purchasing the set, will allow further material to be released in the future. Payment may be made by PayPal (but by arrangement only and NOT to the above e-mail address) but incurs a surcharge of £1 as a result of PayPal admin charges. Please contact the e-mail address above.